When I was a child, my folks would gather with our extended family for trips camping on the North Canadian River. Often, we would stay for weeks in our ragged caravan of tents, trailers and truckbed campers. Some friends of the family owned farm land on the North Canadian River and kindly allowed us entry for camping, fishing and hunting. It has been too many years for me to remember how to get there or even the names of any nearby towns. In those days, we just called it Russell's Place. I caught my first catfish there and weathered my first truly frightening Oklahoma hail storm there. I miss camping at Russell's like I miss the boundless energy and easy friendships of childhood. This weekend Dianne and I followed the roadmaps searching for river crossings to put our kayaks into the North Canadian River and the South Canadian River. When I was a child, just about every bridge over every major river had access to drive underneath fish, camp or whatever. My friends, the times have really changed! Today, old bridges are replaced by new ones that are designed to 'protect' the river from usage. On our kayak-trip scouting effort this weekend, we found precious few public access points that we could park our car at to paddle the river. 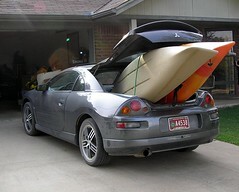 Thankfully, we did find a few put-ins available for us to share with other Oklahoma kayakers. The South Canadian River looks mighty large on the map, but in the midst of this drought the river has become a tiny creek with wide sandy banks. You can access this river at in Calvin, OK on Hwy 75 and also on Hwy 48 North of Atwood, Oklahoma. Google Map of South Canadian River Put-in at Calvin on Hwy 75. My beloved old North Canadian River has also gotten quite slender in this strange season. Frankly, Dianne and I can't help feeling a little bit responsible for this drought. Buying two kayaks was just asking for it! We were very surprised to find the Hwy 48 Bridge at Bearden accessible. As was the tradition in my childhood, the road leading under the bridge was awful... even when dry. Unfortunately, there were a few things that I didn't remember from my childhood: graffiti and litter. Google Map of North Canadian River Access at Bearden on Hwy 48. My Dad says that litter and crime are the reasons why the authorities are closing off Oklahoma's bridges as river access points. I can't help but believe there are better ways to deal with these issues than shutting off public access. Little Deep Fork Creek Near Slick, OK. The biggest surprise of the day was when we paddled Little Deep Fork, a creek not too far from the farm I grew up on. In fact, the bridge we parked at to paddle Little Deep Fork was right on my old school bus route. Like every other body of water in the state, Little Deep Fork is quite low, but it was not too low for our kayaks! We were able to paddle a crooked mile or so on crystal clear waters before coming to a small falls that looked too dry and rocky for our boats/skills. It is a quite nice creek to paddle, even now with no noticeable current. Dianne and I are eager to try the falls once the water comes up. Next time we paddle Little Deep Fork we will try to do a little KFing, we saw several fish boldly following our kayaks along the narrow channel. Who knew the water would be so clear? Google Map of Deep Fork River Put-in at Slick. Our last paddling stop for the weekend was another upstream paddle on the Deep Fork River. No clear water here, but we entertained ourselves by salvaging a mess (literally) of free fishing gear tangled in the logjams. I've been warned before about the poor quality of salvaged hooks and lines, but I figure they have the advantage of knots that were tied by someone other than me! Besides, our kayak fishing is strictly recreational anyway, I can live with a few more getting away. You can paddle for several miles up the Deep Fork River, here at the put-in near Nuyaka Creek Winery. There are no portages, just some tricky logjams to weave through. We have found that in our kayaks we can paddle well in water just a few inches deep. Anything shallower than that is plowing, not paddling! At this depth and flow, Deep Fork is nothing like whitewater paddling or even like floating the Illinois River. Traveling both upstream or downstream requires paddling, not floating, which makes it the closest thing to exercise in both our lives. The low rivers provide wake-free paddling with ample protection from the Oklahoma winds, a fact we were very thankful for yesterday. Google Map to Deep Fork River Put-in near Nuyaka Creek Winery. The Wichita Eagle recently did an article on Wally Seibel, a Kansas kayaker who loves paddling the Arkansas River. His likes to paddle from a put-in just south of Wichita, to the upper end of Kaw Reservoir about 15 miles into Oklahoma. One of three navigable rivers in the state, Seibel said he launches on the Arkansas at public ramps, or where he has permission from a landowner. He kayaks the river as often as possible, and said all seasons have their advantages. Look for a cool article on the Oklahoma Eagle population. We paddled several miles up Deep Fork from the bridge near Nuyaka Creek Winery today. The water is so low that there isn't much difference paddling upstream or downstream. Still, I love padding this creepy, curvey maze of logjams. More pics on Flickr. Our kayaks are ideal for squeezing between the driftwood, trotlines, beaver dams, etc. I think we might take another paddle down the Deep Fork River this weekend, we didn't quite get enough last time. Cooler weather is right around the corner, the leaves are changing and last weekend we forgot the camera! All great reasons for a weekend trip paddling down the mighty muddy Deep Fork River. True, it doesn't offer the thrills and crystal clear waters of the lower Mountain Fork River or the bevy of canoe liveries that line the Illinois River. However, paddling the Deep Fork River offers wonderful solitude, diverse and abundant wildlife and an obstacle course of curves, underwater logs and maze like logjams to negotiate. Even at its current low water level, there's Plenty O' Muddy Fun to be had by all! Not only is cooler weather right around the corner, but so is the annual Deep Fork Music Festival in Chandler, OK. Held on the first weekend of every November, this festival features Oklahoma's finest grass-roots music performers. The Deep Fork Music Festival is also the home of the Oklahoma State Autoharp Championship and the Deep Fork Festival Dulcimer Championship. Spend the night at the campground and enjoy music, food and all-night Bluegrass, Country, Folk, Blues, Red Dirt, Traditional Mountain Music, Alternative Country, Appalachian, Grass-Roots and all manner of Acoustic jamming. Check out the list of pickers and grinners schedule to appear: 2005 Deep Fork Music Festival Line-up. If that's not enough to get you out and about for an Oklahoma Road Trip this weekend, how about lake paddling? I'm tempted to head out to Tenkiller Lake or Keystone Lake this weekend...they say it is for the birds...the migrating birds! Since this year's strange weather brought us another summer weekend, right here in the midst of autumn, Dianne and I hit the water again. This time we stayed close to home and paddled the Deep Fork River near Nuyaka Creek Winery. We had scouted out the put-in a couple weeks ago, when I busted my foot. After spending the last two weeks on the couch, I was eager to do some paddling. Kayaking in the Deep Fork River proved to be more fun than either Dianne or I was expecting. When I was growing up in Nuyaka, I spent many hours along the muddy banks of Deep Fork trying to catch a catfish. I can't say it as one of my favorite rivers, but it was close to home. There are loads of huge catfish in that river, but catching them can require a great deal of patience. The most exciting fishing I ever experienced on Deep Fork was running Trot Lines or Noodling. When sitting on the riverbank fishing with a rod, I would get just a couple bites in a day. I think I finally figured out Deep Fork's secret this weekend, if you really want to have fun...leave the fishing rod at home. The best fishing on Deep Fork is with bank poles, limb lines, jugs and trotlines. Paddling the Deep Fork River in our kayaks was lots of fun. The river is as crooked as an Enron accountant, so you are constantly wondering what is around the next bend. Logjams are piled up all over the place, but our narrow kayaks slipped between them with ease. We saw a couple of folks bank fishing under the bridge at the put-in and no other people for the entire trip! Since we were paddling alone, and the Deep Fork River offers no canoe liveries, we had to make it a two-way trip. We paddled down the river a few miles and then paddled back upstream to the put-in. Sadly we don't own a good paddler's GPS, so I can't tell you how far we paddled, but by the time we made it back upstream, we were pretty tired. Although we didn't cross any whitewater rapids or paddle down any waterfalls, we still had a great time exploring. Paddling Deep Fork is sort of like a primitive, less scenic version of the Illinois River. The main event is dodging logs and low water spots. Wildlife, of the non-human variety, is more common on Deep Fork and the water is red and muddy. The banks are red clay, rather than the gravel or sandy banks common on more scenic rivers. If you are walking the banks this red clay mud will build up quickly on the soles of your shoes making them heavier with each step. There is something kind of weird about the scenery on the Deep Fork River, like it is a remake of the Illinois River directed by Tim Burton. The river floods regularly, so it is full of big, leafless trees stretching their branches out at bizarre angles. No longer rooted to the earth, the trees splay themselves out unnaturally. The barkless branches begin to look like flailing arms, frozen in their fight against the river's current. Everything looks slightly alien here. In the water are slender Aligator Gar with long toothy snouts - most unfishlike. Black Dragonflies cluster together on Deep Fork swirling around paddlers curiously before whisking off to parts unknown. From the giant, yellow Flathead catfish to the massive Leatherback turtles, nothing looks quite like you expect it to. There is one whitewater rapid at the put-in point on this trip, but we did not paddle it. This used to be the site of a low water bridge. Large sheets of rusty metal poke up ominously in the deepest parts of the rapid. At the current water level in Deep Fork, it just looked too dangerous for a couple newbies like my Wife and I to run. This time we paddled for a few miles below the rapid. Next time, we will put the kayaks in above the rapid and paddle upstream for as far as we can. Hopefully, we won't forget the camera next time. I'll let you know how it goes! Know any good paddling spots on the Deep Fork River?